All prices include the 25% off the regular website price! 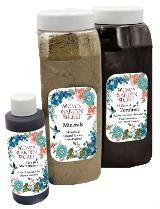 Mom's Garden Secret Minerals give the plants all the minerals they need to grow healthy and provide you with abundant produce or flowers. It has 90 minerals instead of the 3 that man-made fertilizers have. Apply once a growing season or more often as needed during rainy seasons. 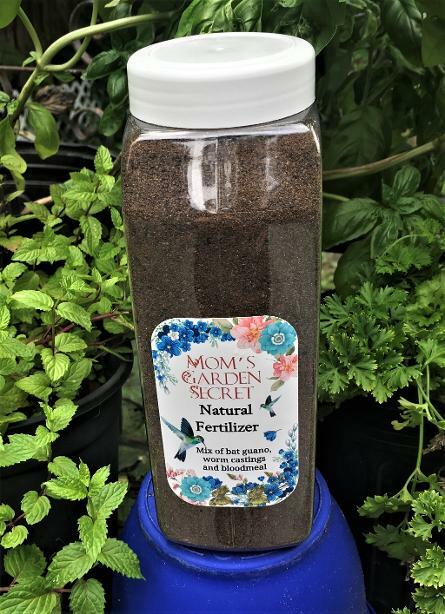 Mom's Garden Secret Natural Fertilizer adds more nutrients needed by the plants to grow lush green leaves and abundant flowers and fruit. It contains bat guano, worm castings and blood meal combined in the proper ratios to effectively booster the plants' growth. Mom's Garden Secret Microorganisms are a combination of all the microbes vital to the plants' health. It helps the plant fight off fungal diseases as well as harmful insects. It also helps the plants utilize the minerals and fertilizer more effectively. A perfect companion to the minerals and fertilizer. 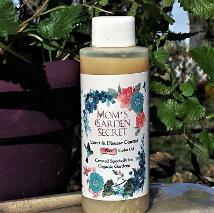 Mom's Garden Secret Insect and Disease Control is a great natural and effective product to control insects that eat your plants down to the ground. It also is great for controlling fungus diseases that devastate the garden plants. It is effective and yet harmless to you and your family and pets. It also won't damage or pollute the environment. This product has an additional cedar oil added for enhanced insect control. GET ALL THREE AT THE PHENOMENAL PRICE OF 49.95!